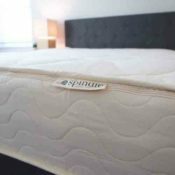 Home » Spindle Mattress Review – Real Firmness Options? Spindle Mattress Review – Real Firmness Options? Are you looking for a mattress with that perfect amount of firmness? You might want to take a look at the Spindle mattress. The Spindle is very unique in that you have four firmness options to choose from. In addition, you can flip and rearrange the latex layers to really hone in that perfect balance of comfort and support. I received the medium model in the softest configuration, and I was very excited to try out this fascinating design. 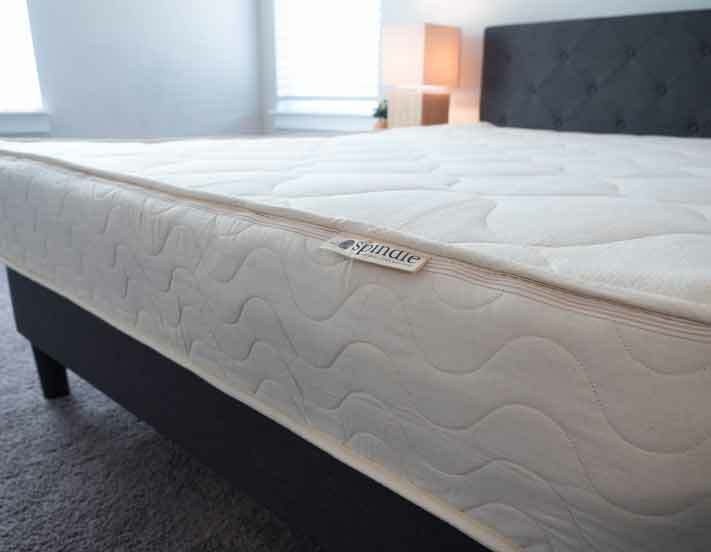 Will you find the right firmness for you on the Spindle mattress? Read on for my full review. Note: The Spindle is a heavier mattress, and the company recommends only using beds and foundations that can support this extra weight. If there is not enough support, the latex will feel softer and less supportive. For our review and testing, we placed our Spindle on a platform bed with wood slats. Spindle is an innovative, all-natural latex mattress that has a great combination of comfort and support. You can get $200 off the Spindle mattress by clicking the link below and using code CLARITY at checkout. You are looking for an all-natural mattress. The latex in this mattress is all-natural and does not contain the chemicals you might find in other types of mattresses. If you want a clean, natural option, the Spindle should be a great choice. You are a hot sleeper. If you overheat while you sleep, the Spindle should work for you. The latex creates a cooler sleeping surface, and it doesn’t trap heat the way other mattress materials might. You should be sleeping cool on the Spindle mattress. You are looking for a long-term investment. While this isn’t the most affordable mattress, it should last longer than many other online mattresses. The three latex layers are very durable, so they will stand up to many years of wear and tear. You will spend some money up front, but it is a very good investment. You want firmness options. If you aren’t exactly sure what firmness is right for you, the Spindle could be a good choice. When you are ordering, you choose from one of four firmness options. You can then flip and rearrange the top two layers to find the exact firmness to match your sleeping preferences. You want a more affordable mattress. If you are looking for a value mattress and want to save some money, the Spindle might not be for you. The latex is naturally sourced, making it quite expensive. Because of this, this pricier mattress might be outside of some people’s budgets. You are not a fan of bouncy mattresses. If you don’t like a responsive mattress, the Spindle might not be the best choice. The latex mattress is very bouncy and you sleep more on top of it. If you prefer to sink into your mattress, it might be worth considering a memory foam option. You prefer a lighter mattress that is immediately ready for use. When you receive your Spindle mattress, it comes in three boxes. Using the instructions provided, you assemble the mattress based on your desired firmness. This process is difficult, and the different layers are heavy and somewhat awkward. The cover is made from organic cotton with a wool batting. Then are three 3” layers of rearrangeable foam rubber made out of Natural Dunlop latex. The latex is Okeo-Tex and Rainforest Alliance Certified. The Spindle is made in the USA. When you order the latex mattress, you choose from Soft, Medium, Firm, and Extra Firm. The company will send you three layers based on your choice. You can then rearrange the top two layers depending on whether you want to make the mattress a bit softer or firmer. Overall, there is a good balance of comfort and support. The latex layers are all very bouncy and fast to respond. Even after you apply a good deal of pressure, they snap back into place. It should easy to move around on the mattress. The three latex layers are also very durable. The natural Dunlop latex will stand up to years of use, so it should be longer-lasting than many other foam mattresses. It should also be a cooler sleeping mattress. The latex is a very breathable material, so it shouldn’t trap heat like other bed-in-a-box mattresses. In the end, you shouldn’t be overheating on the Spindle. When it comes to firmness, there are multiple options. In my experience, with the softer configuration of the medium model, the Spindle felt like a 6.5/10, about average in terms of firmness. Lying on my back, I felt very well supported by the mattress. In addition, the top layers conform to the shape of my body. When I move to my side, I feel very great pressure relief on my shoulders and hips. However, when I am on my stomach, the mattress is a bit too soft for me. Again, that is my experience with this particular configuration. If you are stomach sleeper or just need more support, you should be able to find what you need in one of the configurations. Regardless of what model and configuration you use, the mattress has a very bouncy, responsive foam feel. It is very easy to move around on the mattress, and I never feel stuck. Latex mattresses are not always the best at handling motion transfer. Because of this, I was not surprised by the results of my motion transfer tests. I placed a glass of water on the mattress and, when I pushed into the surrounding area, the water was disturbed. Also, I lay down on the mattress and asked Marten to move around on the other side. I did feel his motion transfer to my side of the bed. If you sleep with a partner, it is worth noting that you might be disturbed by their movements during the night. If it is a real concern, you might want to consider a memory foam mattress. If you do sleep with a partner, you also want to think about how much of the mattress you can really utilize. Basically, can you sit or sleep near the edge of the mattress without feeling like you are going to fall off? Sitting on the edge of the Spindle, I don’t feel very secure. I get a bit of that feeling that I might be ejected from the bed. Also, when I lie down near the edge, I do feel like I might roll off. Overall, edge support is not a highlight of the Spindle. What’s interesting about the Spindle mattress is that you can configure it for different firmnesses. We did the softest version of the medium configuration. On my back, I feel very nice support. My hips sink into the top layer, but not too far. When I move to my side, I feel surprisingly good pressure relief. I am usually not a fan of side sleeping on latex mattresses. However, with the Spindle, I feel very little pressure on my shoulders and hips. The mattress was a little too soft when I moved to my stomach, and I wasn’t properly supported. However, you can change the configuration if you need more support. No matter your preferred sleeping position, heavier people you should be able to find a good balance of comfort and support on the Spindle. It is interesting to note that, even for someone of Marten’s size, the mattress is both supportive and comfortable. If you are larger than Marten, you can opt for a more supportive configuration. The Spindle mattress is unique in that it is shipped to you in three separate boxes. There is a mattress layer in each box, and the layers you receive depends on what firmness you prefer. These layers come with instructions and you can decide what configuration you prefer. When we ordered our mattress, we opted for the Medium model. Then, using the instructions, we decided on the soft configuration. When you take the layers out, carefully cut them out of the plastic. Then, using the instructions, place the cover down on your bed or foundation. You are then ready to put the layers into the cover. There are markings on the side of each layer that will tell you which way is up. You will definitely need the help of one or two people. The latex layers stick to each other, and you want to make sure you get them all lined up correctly. Once this is done, simply zip up the cover and you are good to go. Spindle is an all-natural latex mattress at a really unbelievable price. I had a great time sleeping on the mattress, and like that you can adjust the firmness, though note it does require some assembly. There are options for all types of sleepers. No matter what position you sleep in, you should be able to find the right amount of firmness on the Spindle mattress. It should be a good, long-term investment. You will pay a bit up front, but this durable mattress should last you for a long while. The latex means this is a cooler sleeping mattress. It is breathable and shouldn’t trap too much heat. It is a quality, all-natural mattress. The mattress is made from natural Dunlop latex, so it is chemical-free. Fans of bouncy latex mattresses who want firmness options should really enjoy the Spindle mattress. In addition, the Spindle is a great option for hot sleepers who want a long-term investment. I will note that it is difficult to assemble the mattress when it first arrives. The layers are heavy and a bit awkward to deal with. Also, it is on the pricier side, so keep that in mind. The Spindle comes with a 365 Day Comfort Guarantee, a 10-year limited warranty, free shipping, and returns. If you want to replace one of the mattress layers, you can do so through Spindle’s Comfort Life Program. What process of making the mattress is used Dunlop or Talalay? tried to use the discount code CLARITY on Amazon, would not work? Esther another way to order it where it would be applied ? Can’t do that on Amazon. It has to be on their site. My experience—- I just purchase a King size Spindle mattress. 10″ I have had it less than a week. So far, so good. 5 Boxes for 3 layers and king size foundation arrived together just 3 days after order, assembly of foundation and mattress was easy.I did have a helper. It would have been difficult but not impossible to assemble this myself. Once everything is in place and zipped up, this is a heavy mattress. No glue is needed. I have a firm (2 firms and a medium), so I cannot speak of the softest latex but I don’t believe this will ever shift. or separate. Very good review! You say that they use all natural latex , is it organic latex? Hi Joe. I appreciate the detail in your reviews. Have you tried Sleep on Latex and if so, how does it compare with Spindle? I have not tried that one yet unfortunately. I cant decide between the spindle, plushbeds, zenhaven or nest bedding Q3. If you take money out of the equation, which bed is the most comfortable? I did find the Spindle to be quite comfortable, but I’d caution you against just taking my word on this. If you have a gut feeling about one, I’d say go for it. They are all very similar. They are very similar. It’s hard to say one is definitely better than the other. The Spindle is a few hundred bucks cheaper, so if you really can’t decide you’ll at least save some extra money! PS-We are buying an adjustable bed. Hi Barbara – this could be a concern, but I didn’t have any issues with Spindle. The layers are incredibly heavy, so I think if they were aligned properly it would be unlikely for them to move a lot regularly (just my guess).